Head to the Approach where you will find great offers on food and drink. Together with the live bands you are sure to have an entertaining evening. 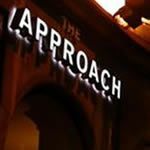 What did you think of The Approach? They have some good acts and food is usually pretty good. Nice open bar area which is good because it gets quite busy. Decent selection of drinks, ok food and good live music but a bit overpriced. Nearly £4 for the wifes pear cider!!! !